1. What does a “souvenir” mean? The word “souvenir” originates from the French meaning of the word (of the same spelling). It means memory, and they are often used as a keepsake or memento of a memorable event or holiday location. It’s important to have the name of the city, state, country and name of your attraction on your souvenirs. It’s what most souvenir buyers want. 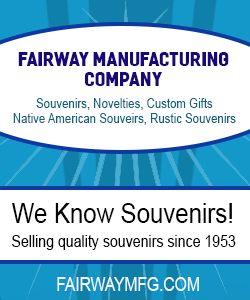 At Fairway Manufacturing, we manufacture clever and attractive gifts for your souvenir store or shop. 2. What are the most common types of souvenirs? Common souvenirs that are often bought by international tourists and travellers include clothing such as t-shirts, hats, and scarves, and also common household items such as mugs, tea towels, spoons, magnets and stationery. They are easy to pack and can be used often upon your return. If you buy a toy lets say, you might play with it for a bit, but it eventually breaks, you get bored of it, or you just can’t be asked to bring it back with you because it might not fit in your luggage. Of course, if you drive to a destination, and it fits in your car, you might end up getting something bigger. Most people do however drive, so you want to make sure your souvenir shop has the most popular items for the best ROI. 3. Why do we usually buy souvenirs anyway? Travellers often buy souvenirs as gift ware for friends, family and co-workers who could not attend the trip. This is especially so for food or hand-crafted gifts, and are big business in many American and European gift shops. Places like down south or along the coasts can also have regional hand crafted gifts that are specific to that region. Native American gifts are big business on the reservations or states where there is a large number of Native Americans live. In England, it’s popular to get certain types of chocolates like Cadbury (yes, it’s different then what you get in the states) or Yorkshire Tea. These are all great souvenir items. Maybe you want to get a hand made glass bowl from Silver Dollar City in Branson, MO. because you visited Branson and loved all the historically made gifts they have there. These souvenirs bring a bit of your experience back for your friends and family to try out and enjoy. 4. What souvenirs can’t we bring back from our holidays? Bringing back souvenirs to the US from overseas could land you in a lot of trouble with Revenue and Customs if the souvenirs are certain types of animal skins, shells and ivory, due to international trade restrictions. Always check with your countries Customs department to see what you can and can’t bring into your country. Remember also that certain items you bring into the country, like alcohol, have a tariff you will need to pay. It’s best to buy that kind of thing at a duty free shop in the airport and not at the winery you visited in California. 5. What are some of the most common types of souvenirs? There is an endless variety of souvenirs available for collectors. Souvenir t-shirts, cups, key chains, license plates, figurines, shot glasses, spoons, and commemorative plates provide ample opportunity to pick up a keepsake. Postcards are an easy-to-find and cheap souvenir that travellers can even share with their friends. Mugs and steins are memories you can use or display. Some hosts enjoy giving guests a choice of souvenir glass or plate at dinner parties. Conference attendees also enjoy a regionally appropriate souvenir. Beyond the traditional wholesale gifts, sauces, spice blends, and preserves give a touch of local flavor. Fairway Manufacturing Company carries a HUGE selection of these at wholesale prices. They have been in business for almost 65 years, and are extremely knowledgeable on what will work in your souvenir shop. 6. Where is a good place to find discount souvenirs? Tourists look for souvenirs at resort and hotel gift shops, airport duty-free stores, convenience stores, gas stations, and anywhere they travel. If you are a store owner, hotel manager, conference planner, or frequently host people at your vacation home, buying souvenirs wholesale will earn you great discounts. Your ROI is your biggest concern. 7. When is the best time to purchase souvenirs for my shop? We recommend the fall and before the new year. When you buy wholesale and in bulk, you always get a better price, which in turn, gives your customers a better price, so they are more likely to buy. Your mark-up could change for 10% to 50% depending on the product you purchase. Buy after the summer season to get great close-out discounts. When buying in the fall, you can get ahead of the game. You don’t want to order souvenirs for your shop right before summer. Most wholesale companies get better deals when they order in bulk. Take advantage of that because you get a better price. When you order ahead, you can help guarantee that the manufacturer and whole-seller can order a larger quantity all at one time. This gets them a better deal on the items they sell to you. You want to make sure they have the product in stock you want to sell and ready to go for your selling season. Some whole-sellers need to make a quota of sales before they can even order a specific product. With you ordering early, the whole-seller can place the order earlier to guarantee a pre-summer arrival and lock in a last season price with the manufacturer. Once the new year comes around, you can almost guarantee the price will go up. Order early and have your products delivered when you need them to be delivered. With a stock of discounted wholesale souvenirs purchased earlier then your competitors, you will have a great hospitality gift shop for any visitor during your selling season, at a lower cost.